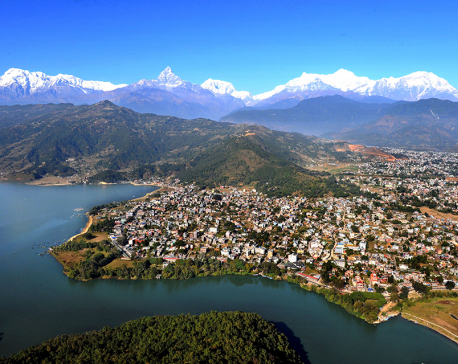 POKHARA, July 7: Province 4 has been named Gandaki Province. A meeting of the Provincial Assembly on Friday took the decision. The provincial capital, however, will remain Pokhara as announced by the erstwhile Sher Bahadur Deuba government. Out of the total 56 provincial assembly members present at the assembly, two lawmakers – Hari Sharan Acharya and Dhanmaya Pokharel Lama, both from Naya Shaktri Party Nepal – voted against the proposal. Naya Shakti lawmakers were for naming the province as Gandaki Tamuwan. Rastriya Janamorcha’s Tek Bahadur Gharti and Speaker Netranath Adhikari were absent during voting. Soon after the parliamentary session began Nepal Communist Party (NCP) lawmaker Mayanath Adhikari had tabled the proposal that Province 4 be named Gandaki Province. Mani Bhadra Sharma of Nepali Congress, Gayatri Gurung of NCP and Krishna Thapa of Rastriya Janamorcha also stood in favor of endorsing the proposal. After voting, Srijana Sharma, who was appointed acting Speaker in the absence of the speaker, announced that the proposal to name the province as Gandaki was endorsed by the two-thirds majority of the assembly members present. With this, Province 4 has become the second province to settle the name and provincial capital. Previously, Province 6 had unanimously decided to name the province as Karnali and Surkhet as its headquarters. Even as Constitution mandates the provincial assemblies to fix names and provincial capitals five provinces—Province 1, Province 2 , Province 3, Province 5 and Province 7—are yet to finalize their names and provincial capitals.